Predicted mean annual heating energy efficiency in Kansas City, MO. Darker areas are less energy efficient. In 2013, nearly 14 million US households had unpaid utility bills and 2.2 million households had their utilities disconnected. One strategic solution has been to address residential energy efficiency; however, the absence of readily available data on household energy use and efficiency presents and impediment to effectively targeting programs to those most in need. 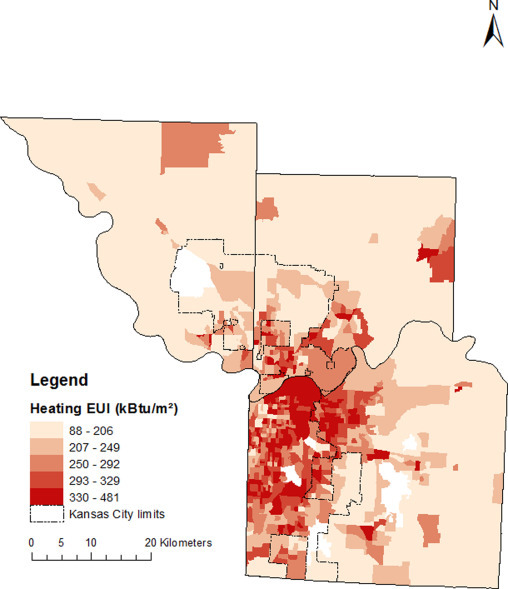 My study, recently published in Energy Policy, used data from the US Energy Information Administration to model energy efficiency in Kansas City, Missouri to explore the spatial, racial/ethnic, and socioeconomic dynamics of space heating efficiency. The results mapped using geographic information systems (GIS) and statistical analysis, show disparities in the relationship between heating energy efficiency and spatial, racial/ethnic, and socioeconomic neighborhood characteristics. Areas with lower median incomes, a greater percentage of households below poverty, a greater percentage of racial/ethnic minority headed-households, and a larger percentage of adults with less than a high school education were, on average, less energy efficient. Results also imply that racial segregation, which continues to influence urban housing choices, exposes Black and Hispanic households to increased fuel poverty vulnerability. Lastly, the spatial concentration and demographics of vulnerable block groups suggest proactive, area- and community-based targeting of energy efficiency assistance programs may be more effective than existing self-referral approaches. Access the full study here (Free access through Oct 1, 2016). Interesting statistics. This research should expand to other areas with questionable disparities as well. Well done Tony…well done! Thanks cuz, yes definitely going to expand to other cities and areas. I have a student exploring similar dynamics in Detroit.